With a complete theoretical framework and a global perspective, Society: The Basics, 13/e offers students an accessible and relevant introduction to sociology. 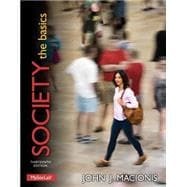 John Macionis, author of the best-selling Introductory Sociology franchise over the last three decades, empowers students to see the world around them through a sociological lens, helping them to better understand their own lives. This informative, engaging, and entertaining title will change the way readers see the world and open the door to many new opportunities. MySocLab is an integral part of the Macionis learning program. Engaging activities and assessments provide a teaching a learning system that helps students see the world through a sociological lens. With MySocLab, students can develop critical thinking skills through writing, explore real-world data through the new Social Explorer, and watch the latest entries in the Core Concept Video Series. Society: The Basics, Thirteenth Edition is also available via REVEL™, an immersive learning experience designed for the way today's students read, think, and learn. Learn more. I am currently using this book for my introductory sociology class. So far it's been easy to read and understand. My favorite chapter so far is the one on population and urbanization. I thought it was the most interesting. Really enjoying my sociology class! Society: The Basics, 13/e: 5 out of 5 stars based on 1 user reviews.